Chapter 6 recounted some ongoing frustrations with the lack of outright progress, but a bit of resolve and a few tense moments later, I’ve managed to make three major leaps forward. 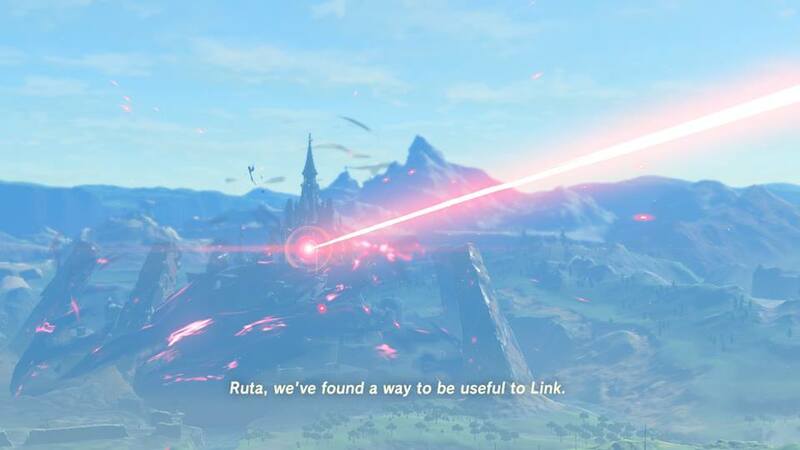 I’d just entered Ruta, the Divine Beast of the Zora. As before, you have to activate five terminals in order to unlock the final control terminal. Also as before, there are elements of the Beast you can control – specifically the trunk, which can be raised or lowered. The consequence of this is to direct water at different locations and spin a large waterwheel. The cryo power comes in handy here too – I used it to great effect to stop one particular wheel, which allowed me to access one of the terminals. Within the larger wheel was another terminal, but this one was barred off. A ball on a slide rail would move up and down and when it made contact with the cage holding the terminal, the bars would raise – here, the stasis power was needed to hold the door open, quickly activate the terminal, and get out again. It took me a little while to suss this one out. Climbing the wheel (especially when rotating) allowed access to other levels of Ruta, and subsequently, other terminals – standing on the trunk as you raise and lower it made other areas accessible too – albeit I was rather cautious about raising it whilst on it – great care was needed to avoid falling! Well, then, I actually beat him. I had a few fire arrows, and despite questioning the wisdom of using them, they actually proved effective. Whether this was because he was weakened already, or because they were actually very powerful, but either way, I had slain Waterblight Ganon and claimed back a Divine Beast! The Zora Champion (I am hopeless with the names of these characters) rewarded me with a heart container, and a healing power. Upon returning to the Zora King, I was further rewarded with a trident. I do like freebies! 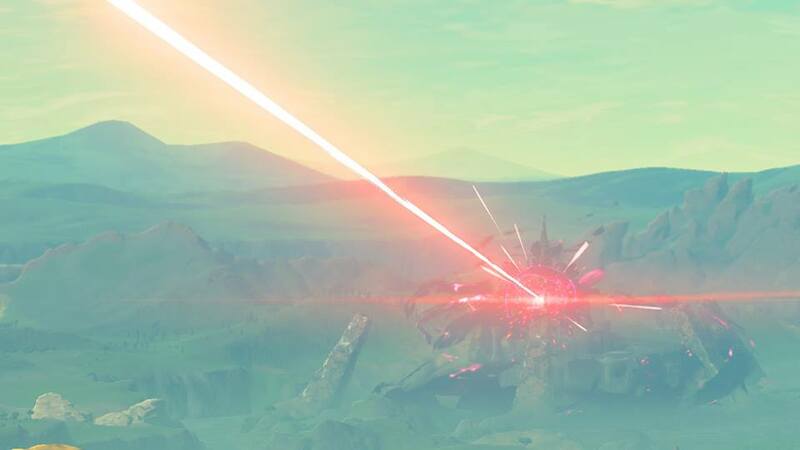 The Divine Beast then fired a beam into Hyrule Castle – a means of helping to subdue or weaken Calamity Ganon. 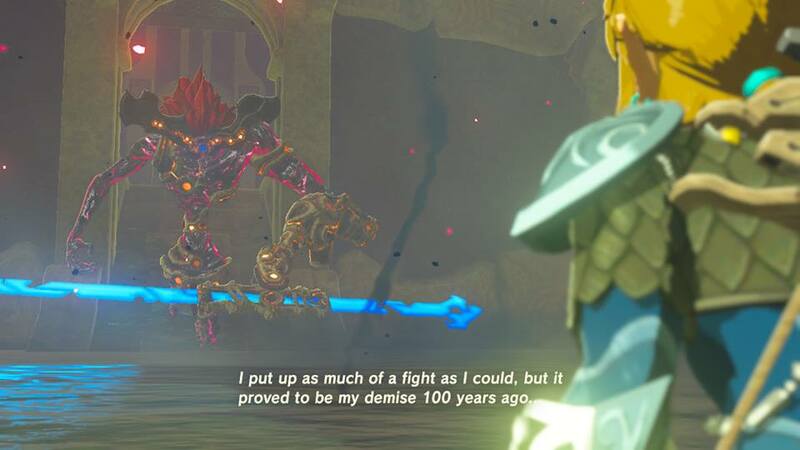 Buoyed by my success, I decided to pit my renewed confidence against Thunderblight Ganon – the fast electrical menace holding the Gerudo Divine Beast. Attempt number 3 to kill this thing… went much better than the previous two. Maintaining a target lock and keeping my shield up meant his quick attack faltered, and he was momentarily drained by his effort – I broke his own shield and slashed at him until his health dipped to 50%, at which point, as with Waterblight Ganon, his attack changed. He flew into the air and dropped metal rods at me, which would become electrified and would them crumble. This was easy to avoid but I had no means of fighting back – until I realised I could use the magnet to hurl these rods back at him, which sent him crashing to the floor. From that point on the battle was a repeat of the earlier stage, and Thunderblight Ganon fell before me. Urbosa (the Gerudo Champion) rewarded me – yet another heart container and the power to bring lightening down upon my enemies. Her Divine Beast also fired a beam at the Castle – and the Gerudo gave me a new shiny shield and scythe. A brief trip north toward the volcano proved fruitless – you can only get so far before the air becomes hot enough to set you on fire. I will have to venture there eventually (the Goron Divine Beast lurks up there), but how to get there? With that particular path currently off limits, I headed west, first travelling to a Shrine – and from there, finding a new Shrine in the cold wilderness of the mountainous region to the north west. I think the Rito are here somewhere, and, to begin with at least, they might be easier to find than the Gorons. The most rewarding event of this latest stage? That was still to come. I had been to enough Shrines to gain yet another heart container, which took me to 13. Feeling emboldened, I went back to Korok Forest, back to the Deku Tree, and back to the Master Sword. Would 13 hearts be the lucky number? It was close. It was very close, but just as I thought I would fail, out came the Sword from its stone. It was mine. However, as already alluded to more than once during this blog, things aren’t that simple. They are never that simple, not in a Zelda game. I took off on a brief adventure to the south-west (trying to reach another Tower – more on that in a mo), and whilst the Master Sword is pretty powerful, and appears to be unbreakable, it needs recharge time if used too much. I don’t know if there’s a way to extend its maximum use time, but it needs to be used sparingly for the moment. The Tower in question proved challenging to get to. The cliff face that greets you from the Gerudo Desert would have required more stamina than I had to scale, whilst going around the other way meant skirting with dangerous enemies – a great big Hinox (a giant Bokoblin) and a Yiga warrior. I managed to kill both – and a host of other baddies – on my way up to a snowy peak. Poor ol’ Link was frozen stiff but eventually, the Gerudo Tower was reached – and wow – this was a big one. If I’d had to climb this from ground level… well, it would have been impossible. Fortunately, when I first reached it, I was high up, and was able to jump upon it from a great height. The accordion-playing Rito was up there, who played a song about arrows, the north-west light and a prize – I’ve yet to put any of his ideas to the test, but at some point would like to. From there, I headed back to a lonely Shrine in the middle of the water near Hateno village, where I took on a beefed up Guardian and won – I’ve now completed around 40 or so Shrines. So, where to go next? The volcano is currently unreachable, unless I find someone or something to help me survive the heat. It therefore seems like some exploring is in order, followed by the Rito?